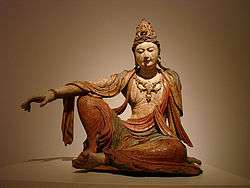 This article is about Buddhist gods. For other uses, see Four Heavenly Kings (disambiguation). 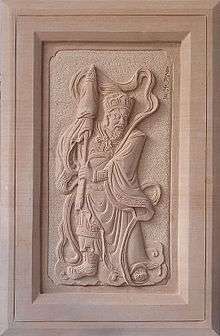 The Four Heavenly Kings are four Buddhist gods, each of whom watches over one cardinal direction of the world. In Chinese, they are known collectively as the "Fēng Tiáo Yǔ Shùn" (simplified Chinese: 风调雨顺; traditional Chinese: 風調雨順; literally: "Good climate") or "Sì Dà Tiānwáng" (Chinese: 四大天王; literally: "Four Great Heavenly Kings"). The Hall of the Heavenly Kings is a standard component of Chinese Buddhist temples. The Four Guardian Kings in Burmese depiction. Description This is the chief of the four kings and protector of the north. He is the ruler of rain. His symbolic weapons are the umbrella or pagoda. Wearing heavy armor and carrying the umbrella in his right hand, he is often associated with the ancient Indian God of wealth. Associated with the color yellow or green. King of the south and one who causes good growth of roots. He is the ruler of the wind. His symbolic weapon is the sword which he carries in his right hand to protect the Dharma and the southern continent. Associated with the color blue. King of the east and God of music. His symbolic weapon is the pipa (stringed instrument). He is harmonious and compassionate and protects all beings. Uses his music to convert others to Buddhism. Associated with the color white. King of the west and one who sees all. His symbolic weapon is a snake or red cord that is representative of a dragon. As the eye in the sky, he sees people who do not believe in Buddhism and converts them. His ancient name means he who has broad objectives. Associated with the color red. All four serve Śakra, the lord of the devas of Trāyastriṃśa. On the 8th, 14th and 15th days of each lunar month, the Four Heavenly Kings either send out messengers or go themselves to see how virtue and morality are faring in the world of men. Then they report upon the state of affairs to the assembly of the Trāyastriṃśa devas. On the orders of Śakra, the four kings and their retinues stand guard to protect Trāyastriṃśa from another attack by the Asuras, which once threatened to destroy the kingdom of the devas. They are also vowed to protect the Buddha, the Dharma, and the Buddha's followers from danger. Statues of the Four Heavenly Kings. From left to right: Vaiśravaṇa, Virūḍhaka, Dhṛtarāṣṭra, and Virūpākṣa. 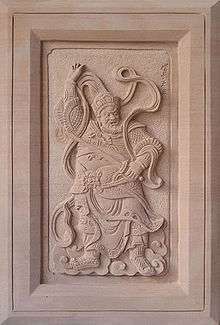 The symbols that the Kings carry also link the deities to their followers; for instance, the nāgas, magical creatures who can change form between human and serpent, are led by Virūpākṣa, represented by a snake; the gandharvas are celestial musicians, led by Dhṛtarāṣṭra, represented with a lute. The umbrella was a symbol of regal sovereignty in ancient India, and the sword is a symbol of martial prowess. Vaiśravaṇa's mongoose, which ejects jewels from its mouth, is said to represent generosity in opposition to greed. Statues of the Four Heavenly Kings of Jikō-ji, Takasago, Hyōgo, Japan. Chaudhuri, Saroj Kumar. 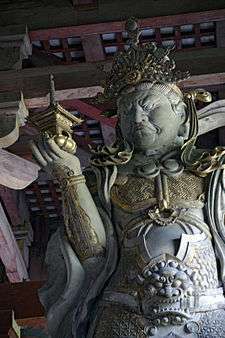 Hindu Gods and Goddesses in Japan. New Delhi: Vedams eBooks (P) Ltd., 2003. ISBN 81-7936-009-1. Potter, Karl H., ed. The Encyclopedia of Indian Philosophies, volume 9. Delhi: Motilal Banarsidass, 1970–. ISBN 81-208-1968-3, ISBN 81-208-0307-8 (set). Thakur, Upendra. 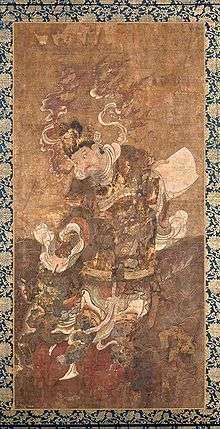 India and Japan: A Study in Interaction During 5th cent.–14th cent. A.D.. New Delhi: Abhinav Publications, 1992. ISBN 81-7017-289-6. Pp. 27–41. Schumacher, Mark. "Shitenno - Four Heavenly Kings (Deva) of Buddhism, Guarding Four Cardinal Directions". 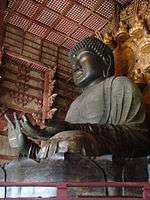 Digital Dictionary of Buddhism in Japan. Wikimedia Commons has media related to Four Heavenly Kings.